A Very Gappy Ganesh Chathurthi to all of you. 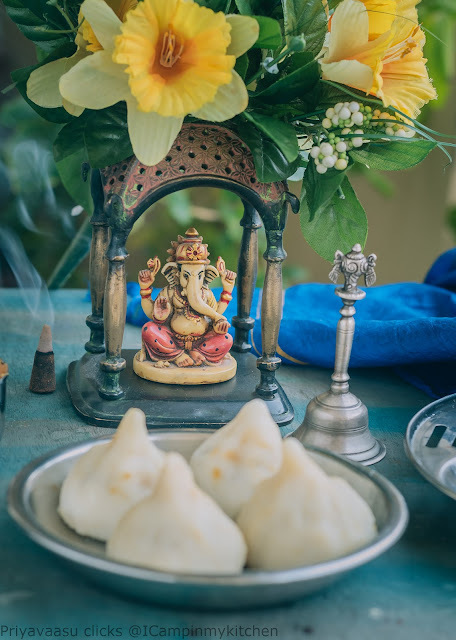 Here is a collection of neivedhiyam/offerings from my kitchen to yours. Do try and let me know how you liked it. Tomorrow is Vinayagar Chathurthi, thank god it is Friday!! Oh yes, it is weekend here and i get to concentrate on pooja and not on school going kid or office going big fella!! I have planned for regular Modagam, Chana Sundal and ulundu vada. Amma makes Savoury/Ulundu Kozhukattai too. Here there is no takers for so much food. Apart from the regular modagam, i m planning to do Ellu/sesame kozhukattai this time. Coz, bala just loved them when i made a sample for the post. He kept asking for second help and i had to make him wait till i complete clicking!!! 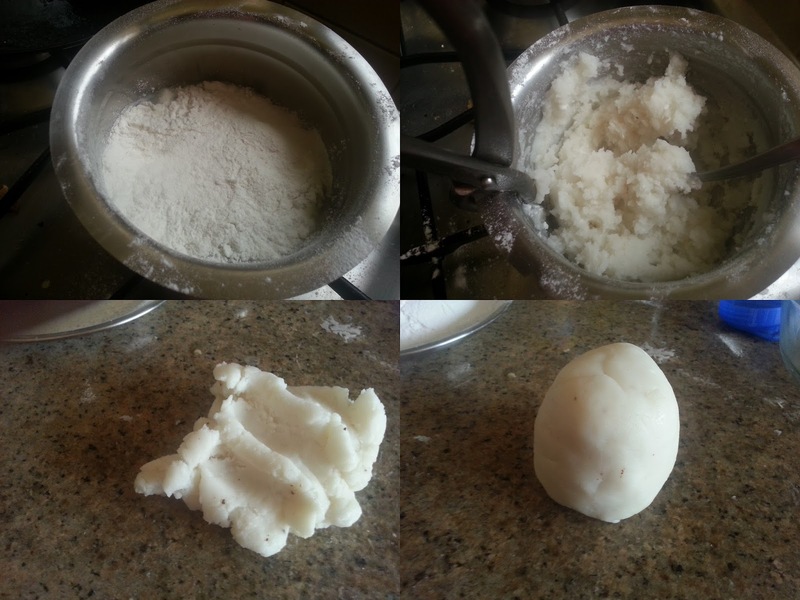 The below measurements make 10 kozhukattai's, so if you are planning to make more, increase the quantity accordingly. Heat water along with salt and oil in a heavy bottom pan. Once it starts to boil, reduce the flame to simmer and add flour slowly to it. Take it off the flame and mix vigorously to incorporate the flour with water to get a gooey-dough. Cover and keep aside. Transfer the dough to flat plate or on to kitchen counte, when it is warm enough to touch, grease your hands with ghee/gingely oil and knead it to get a soft pilable dough. Cover and keep aside until use. Dry roast the sesame seeds in a pan. When it starts spluttering, take it off the flame. Let it cool. Take it along with jaggery and cardamom, pulse it few times in a mixer/food processor to get a fine powder. Do not run the mixer/processor continously or else you will end up with paste. Keep aside until use. 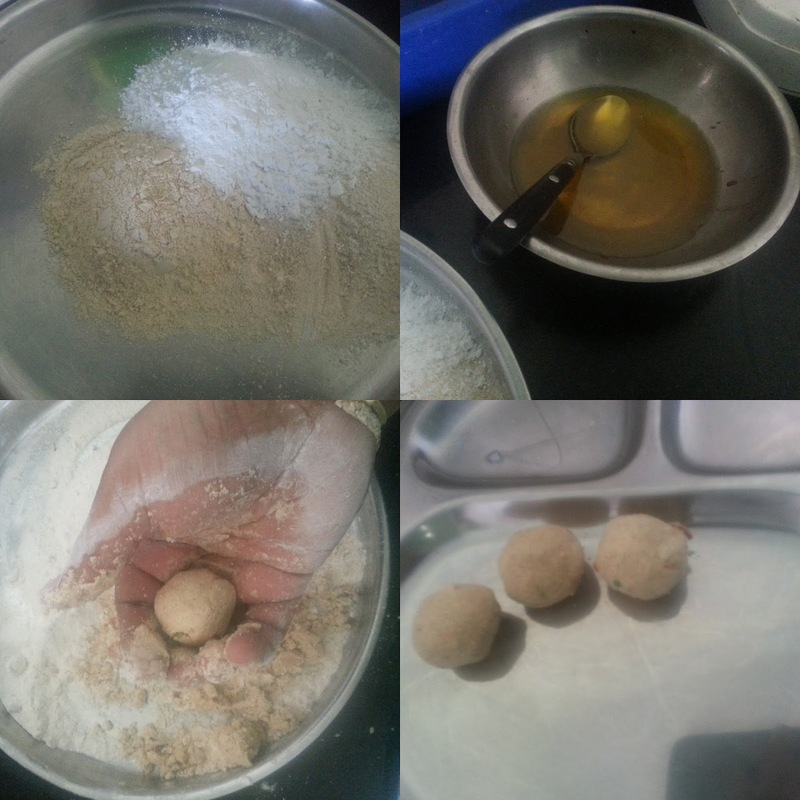 Divide the Dough into 10 equal-sized balls. Take the dough and Shape it into a small bowl. use your thumb, index finger and ring finger of both your hands to shape it. I have attached a Video, hope it helps. Fill the modagam/mothagam with a tsp ful of sesame filling, bring the ends together and close it with a pointed edge. Repeat the same for rest of the dough.